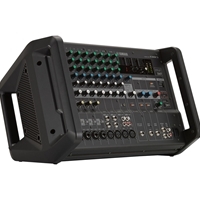 The Yamaha EMX 5 is a 12-input powered mixer with an integrated 1260W amplifier, eight mic/line inputs, four stereo line inputs, and two Aux sends. The mixer features a Hi-Z guitar input on channel four and each channel offers a 3-band EQ for custom tailoring your sound. Channels 1-4 offer XLR-1/4" combo jacks. Channels 5 through 12 provide mono XLR inputs, with channels 5-8 offering 1/4" inputs and 9-12 offering an additional set of stereo RCA inputs. Channels 11/12 also include an 1/8" stereo mini-jack for connecting portable music players. The EMX 5 includes a single knob compressor on channels 1-4, an integrated feedback suppressor, and a built-in multi-effects processor with SPX series algorithms. Additionally, the mixer offers a Master EQ, which provides a single knob to control the level of low end. At the far left, the speech setting cuts low frequencies, while the middle position is neutral for music playback. The far right setting provides a Bass Boost to enhance music playback. Optional accessories available include a foot switch for effects bypass and a rack-mount kit. The EMX 5 ships with a standard IEC power cord.